MECHANICSBURG, Pa. — Sunbury Press has released Terry Ray’s study of the orange orb UFO phenomenon entitled The Complete Story of the Worldwide Invasion of the Orange Orbs. Terry Ray is a certified Field Investigator for the Mutual Unidentified Flying Object Network, known as MUFON. He is a former military pilot and trial lawyer, retired law professor emeritus, and a novelist for Sunbury Press. On the evening of July 29, 2013 in Ocean City Maryland, Terry witnessed eight large orange orbs flying very low and silently along the beach. They performed maneuvers that no Earth-made aircraft could possibly perform, in complete silence. Terry filed a report of his sighting with MUFON. When he met with his fellow MUFON investigators and related his story, he was met with laughter and told that what he saw was nothing more than candle-lit Chinese lanterns. As a former military pilot, Terry knew this explanation could not be true and set about to find out what it was he actually saw that night. This led to a year-long, intensive investigation and, ultimately, to the writing of this book. 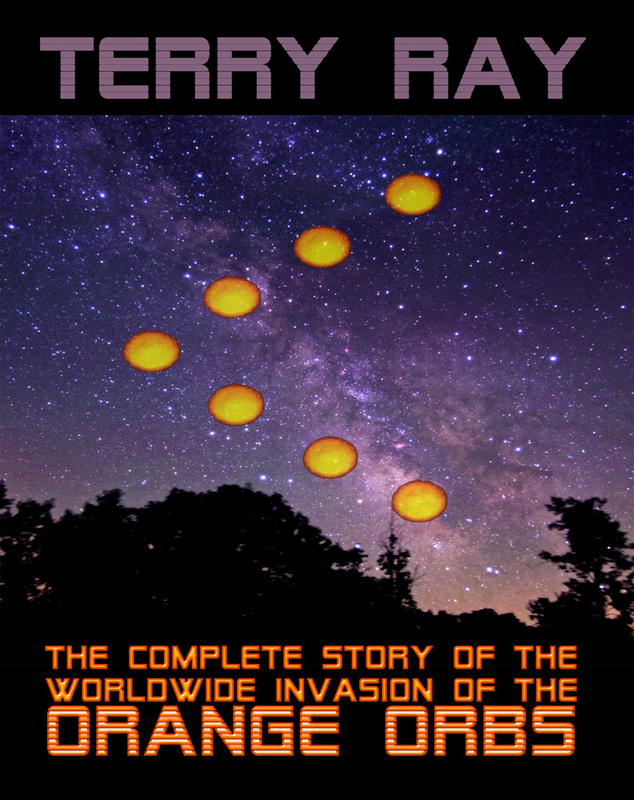 In this book, Terry details the stunning story of the orange orbs that is going on all over the world at this very moment and to a discovery of what could be the biggest event in the history of the human race. The Complete Story of the Worldwide Invasion of the Orange Orbs breaks entirely new ground in UFO research and could be the most important book in this field since Erich von Daniken’s, 1968, Chariots of the Gods. Chapter One – What Do Orbs Look Like? Chapter Two – What Do Orbs Do? Chapter Three – What’s Inside the Orange Cloak? Chapter Ten – Does the Government Know About These Orbs? Chapter Fourteen – How Do They Get Here? PART THREE: What and Why? At approximately 10:00 – 10:15 PM, the witness noticed a small round orange light to the north that appeared to be quite low over the ocean surface at approximately 100 – 300 feet in altitude, near the shore and above the ocean surface, moving on a southerly course toward the witness at a rather rapid rate of speed. Within approximately 10 seconds, the light had reached the size of a full moon and was very bright—the brightness and color approximated the coloring and intensity of a setting sun. The witness had binoculars and focused them on the light. With magnification, the object appeared to be a glowing orange sphere with uniform color and brightness. The color was soft and muted and emanated from the interior of the sphere. The sphere was pleasant and soothing to the eye. There were no other lights or visible characteristics appearing on the sphere. It was entirely silent. The sphere was approximately five to ten miles north of the witness when it reached its maximum size as it stopped several hundred feet above the ocean surface and remained stationary for a short period of time. The sphere then began moving in an easterly direction, straight out to sea, and it diminished in size as its distance from the witness increased. It continued on its easterly course for approximately ten to fifteen seconds until its size appeared to be that of a very large star. At this point, the sphere commenced a straight climb of approximately forty-five degrees on a southerly heading. The climb was rapid and it leveled off at approximately 10,000 feet. It then continued straight and level on its southerly heading. The angle of inclination of the sphere from the witness, at this point, was approximately thirty degrees above the horizon. The sphere continued on its level southerly course for close to ten seconds, then turned to a south-easterly heading in the general direction of the thunderstorm and continued on this course until it was no longer visible, due to the increased distance from the witness. This entry was posted in book releases and tagged aliens, bill birnes, close encounters, mufon, orange orbs, terry ray, ufos. Bookmark the permalink.